Cooling a high-power gaming laptop has always been limited to fan cooling but now Asus is introducing liquid cooling to the mix. That's right, you didn't read that wrong. 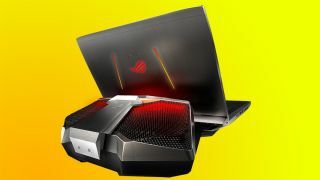 Asus has indeed introduced a water-cooling system complete with a pump and radiator that docks with its new flagship gaming laptop, the ROG GX700. By even regular 17-inch standards, the ROG GX700 looks like an alien pod ready to take off on its own. And so it seems fitting that the liquid cooling module attaches to the back of the laptop as if it were refueling. Asus is short on details about its new flagship gaming laptop, but it will be equipped with a Skylake K-series CPU capable of overclocking and a 4K display. The notebook will also come outfitted with a Nvidia GeForce GTX graphics card, however, concrete details are yet to be determined as is its release date, which is only slotted for the tail end of 2015. Asus also announced a fresh follow up for its mainstay 17.3-inch rig with the ROG G752. The larger than life gaming machine features an all new chassis and design theme that follows the alien jet engine aesthetic of the ROG GX700. Spec-wise the ROG G752 will come equipped with Nvidia graphics up to a GTX 980M with 8GB of video RAM, Intel Core i7-6700Q processor, an optional 4K display and Thunderbolt 3 ports. The screen is also upgradable to a UHD 3,480 x 2,160 panel complete with G-Sync technology. The new Asus ROG G752 will be available in the later months of 2015.